Spa Francorchamps with a Manx Norton. Is there a better combination for a weekend of track riding? The annual Biker's Classic is definitely an event to put in the calendar for next year if you've never been before. The track itself is simply wonderful. Consisting of 4.35 miles of fast, wide tarmac draped over the rolling hills of the Ardenne Forest, Spa is steeped in history and to this day is the home of the Belgian Formula One Grand Prix and the Spa 24 Hours. No longer used for international bike events, the track once hosted thousands and thousands of bike fans keen to watch the likes of GP stars Phil Hill, Mike Hailwood and Giacomo Agostini. The Bikers Classic event is made up out of three sections. 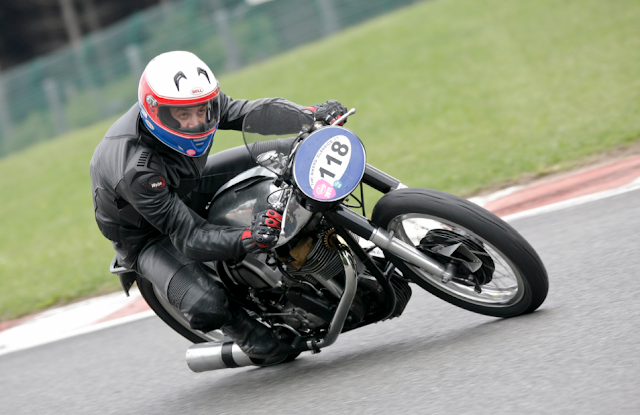 For most mere mortals it is a three day track day for classic sports and racing bikes. 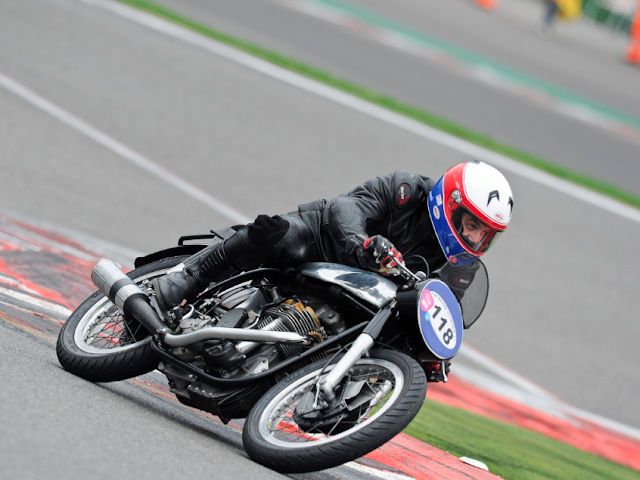 On Saturday night a four hour endurance race takes place for 1970s & 80s Superbikes. Also, throughout the weekend, the GP class provides spectators the opportunity to witness past heroes take to the track on some of the most valuable and rarest machinery ever made. This year we made a base with several members of the Norton Owners Club, all aboard either 350 or 500 Manx Nortons and all keen to sample the delights and challenges Spa has to offer. Due to the long straights and fast downhill sections TT gearing was the order of the day, although a windy uphill access road made the journey up to the new F1 pit lane holding area a lesson in clutch and traffic management! We were running Avon Roadrider race tyres which once warm provide tonnes of grip and having raced with them at Pembrey in the rain, feel confident in their grip levels. They are very pressure sensitive though- 27/28 psi measured cold seemed to feel best. The Manx I was riding is owned my mechanic and uses a '54 frame and '59 350 engine, it's the one in the pictures with an unpainted short circuit tank. Originally delivered to Sweden the machine was sourced from Ireland. I'd like to think it's possible that it raced at Spa before at some point during it's journey to Dublin...? Who knows. The machine ran well, albeit requiring slight fettling between track sessions. At one point we noticed a crack in the alloy primary chain guard. Following a quick dig around in the van we found an old VW Beetle exhaust mount that just happened to be the perfect length to act as a replacement support. On it went and there it stayed all weekend! Overall I completed about 25 laps of the circuit and with a little rain on Friday, some much faster than others. The scenery at Spa is beautiful and although concentrating on the job in hand, the famous forest backdrop makes for exhilarating riding. Roaring down the old start/finish straight up against the wall into Eau Rouge, will stay with me for a quite few years yet! The long van journey was very much worth it and the weekend wouldn't have been possible without my trusty mechanic. So a final thank you goes out to him and for the support of the rest of the NOC for one of the best biking weekends. EVER. The video below features two laps taken on-board the 350 Manx, apologies for the poor sound quality..